Third update for the day. I was up just after 7am and the sky was clear and the sun was just beginning to shed light on things. So I got my gear together and headed out for a little "early-morning" painting. If you've been following along in the last few weeks, you know what happened next. Yes, the clouds rolled in. But I soldiered on. 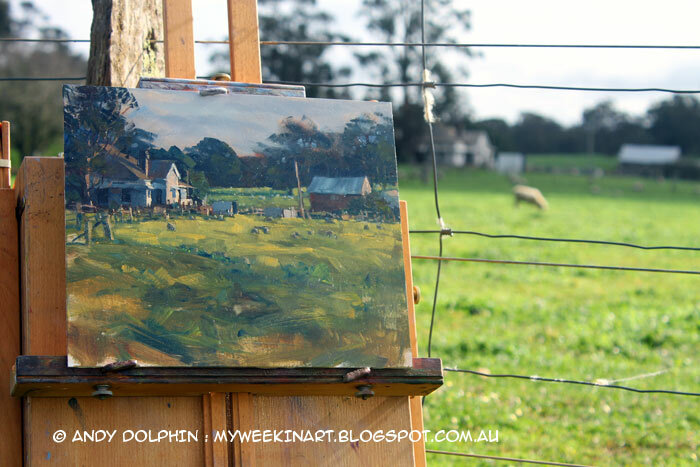 I set myself up in a paddock looking towards the abandoned cottage I painted last weekend. I noticed this view yesterday afternoon and realised it would light up nicely in the early morning. And I was right. Things were exactly as I expected, when the sun broke through the clouds. 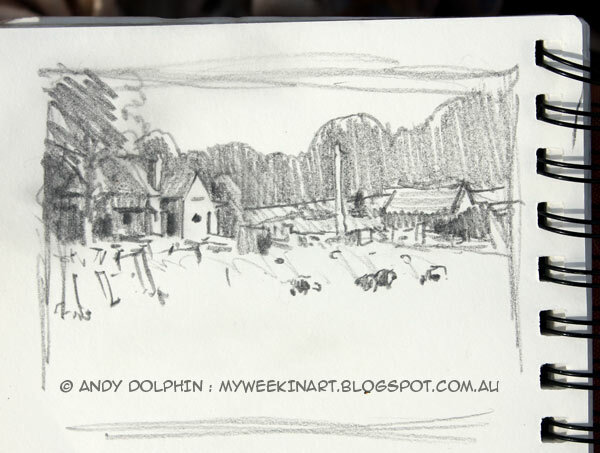 I did a quick thumbnail while the sun was shining and committed as much of the scene to memory as I could. 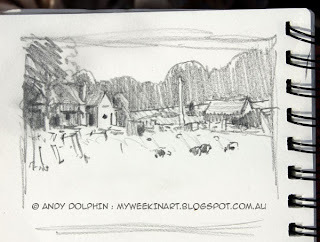 It was far too cloudy to risk a big painting so I grabbed a small board and set about doing a sketch. It was cloudy most of the time, so plenty of memory was required and it rained on me, again, and it was cold (I wore my gloves again and even took a mid-painting warm-up walk) but things progressed pretty well. I spent about an hour and a half on this one, which is a bit longer than usual for a small sketch but things do slow down when the clouds roll in. 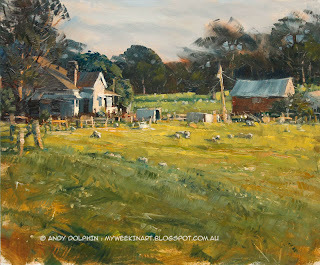 I finished off the foreground and touched up a few details when I got back to the studio, so add another 15-20 minutes. 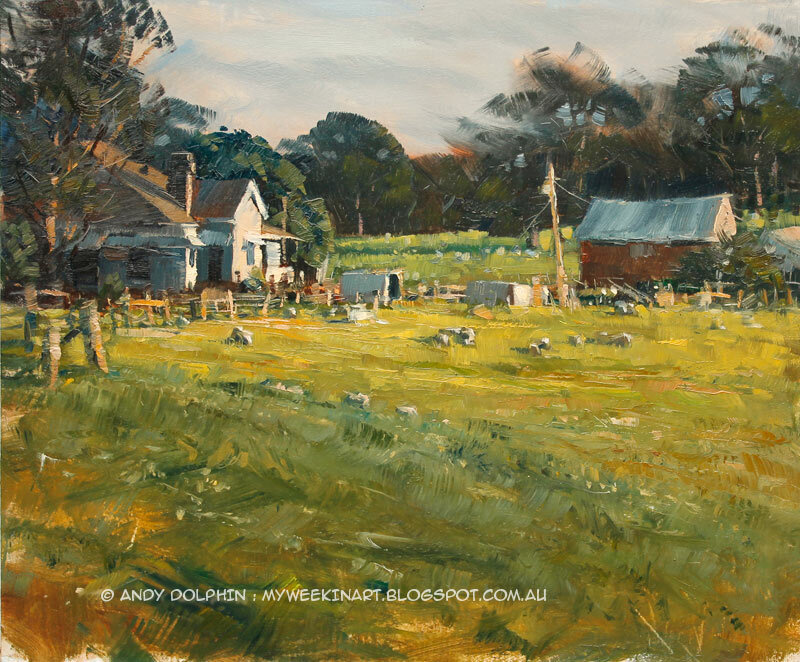 I used a limited palette of ultramarine, burnt sienna and cadmium yellow deep. The lack of a true red meant that shadow tones and greys would retain an earthy hue rather than leaning toward purple. The burnt sienna under-painting shows through in a few spots too, including the warm glow in the otherwise-grey sky. So now I've done eight paintings in the last few weeks and have been rained on six of those times. I think that's a record for me. Lucky I don't do watercolours. I've checked tomorrow's forecast and apparently we're in for some more rain. So I guess I'll venture back outside and see what happens.